It’s official, the new Alchemy synth is HUGE. It’s better even than the original Camel Audio version. One of the most obvious visual attractions in its interface are the 8 Transform pads, which enables you to morph and change your selected presets' sound between different settings. Think of it as a more fluid way to automate or modify the sound using an advanced XY pad. While you may think Alchemy's performance controls are great for performers—and they are—they are just as useful for producers and sound designers alike when sculpting new sonic palettes or creating interest through movement within a sound. You just have to play with the Transform pad briefly to get a sense how inspiring it can be. The new Alchemy synth in Logic Pro X 10.2 packs quite a punch! 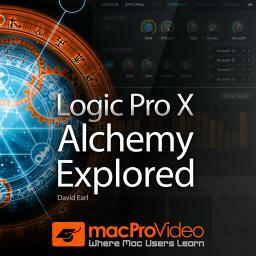 In this 8 minute video from his Logic Pro X 208: Alchemy Explored course, master Logic trainer, David Earl (aka SFLogicNinja) shows how to create incredible textures and patterns using the transform pads, how to create your own snapshots and how to control them using your MIDI controller. Alchemy = mind-blowing synthesis. It’s that simple... and Apple’s reimagining of this deep instrument gives Logic users an exclusive, musical tool that ushers in a new era of music production. Learn Alchemy right here with David Earl! You can also use Alchemy's Smart Control interface with other Instruments. I use the 'Controls' frame and set up the 2 x/y pads to control the 'Morph' and the 'Material' axis controls of Logic's Sculpture.